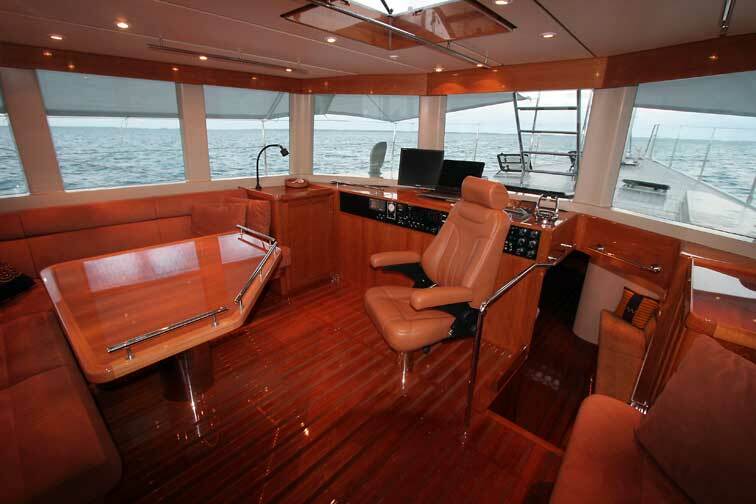 That the ambiance of the interior, its physical comforts at anchor, and at sea, work, can be seen by the 45,000 miles we’ve put on the FPB Series prototype in the first four of years of cruising. 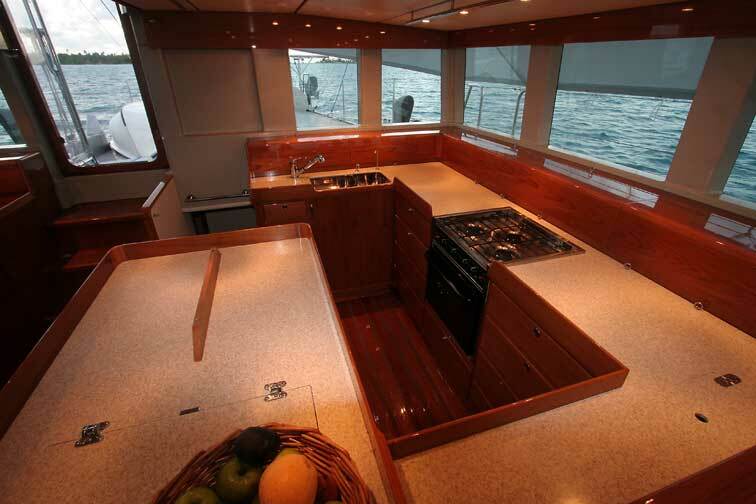 A key part of the functionality of any sea going yacht is how easily you can hang on, wedge yourself in, and move about the interior when you are on passage. 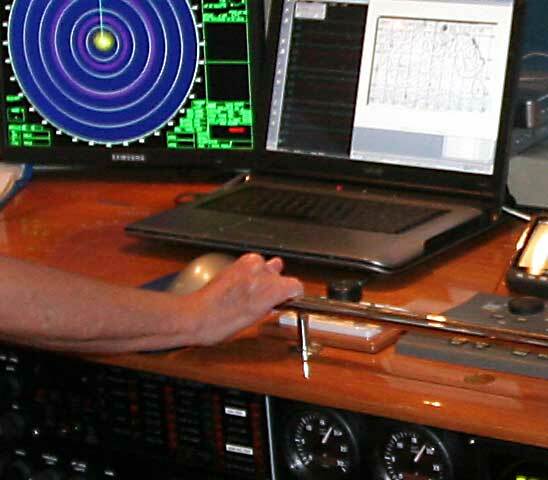 Even with the FPB, which has very little motion at sea compared to any other design of which we are aware, we want to have something to hang onto as we move around. This applies in all areas of the boat, even the head and shower compartments, sleeping cabins, and working areas in the saloon. 99% of the time we do not need these handholds. But occasionally the boat takes an unexpected lurch – maybe it is once every passage – and when this happens we want to be firmly held in place. Entering the interior requires traversing three steps. There are handrails available on three sides, which can be held onto until we can transition to saloon level handrails. The photo above, taken from the entry way and looking forward, will give you a feel for the handrail layout and how the furniture holds us in place. You can comfortably lean against the vertical faces, grip the fiddles, or hang onto the overhead handrails. 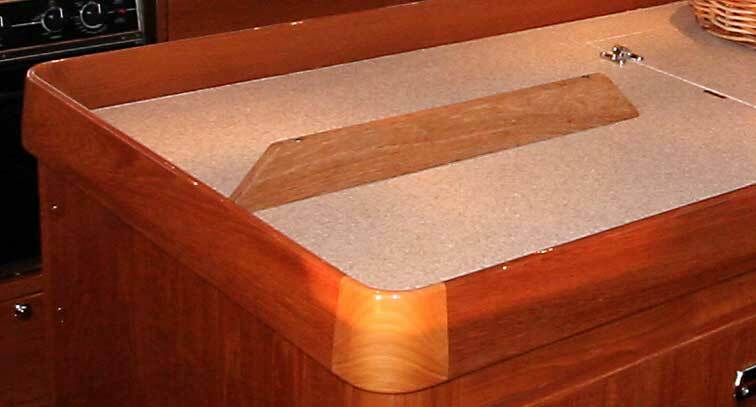 Galley fiddle rails are high: three inches (75mm) above counter height. These hold items onto the horizontal surface on the rare occasion that we’re popped by a big sea, and serve as excellent hand holds. Overhead handrails, like these, are installed throughout the interior. Even in the galley, which has a secure layout for holding us in place, we’ve got handrails. They are rarely used, but when they are held onto we are very happy to have them. Speaking of the galley layout, here is a view from forward looking aft. This will give you a better feel for how well contained we are. Handrails are installed in the saloon as well. The three on the table are always in use at sea. In port, if we are entertaining, they are removed. 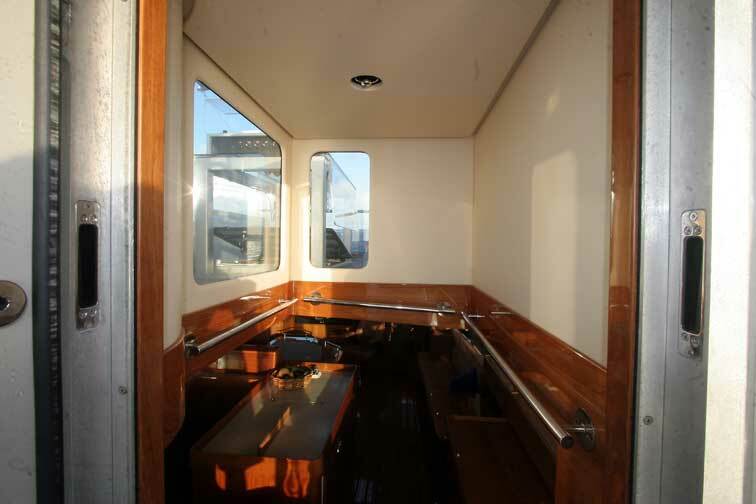 Note the rail alongside the companionway down to the forward cabin. As you walk down these steps there is an easy transition from these handrails to those of the forward cabin. We added a pair of counter top level rails help out when on watch.. There is an opening in them in front of the computer, to allow us to type and operate the mouse. 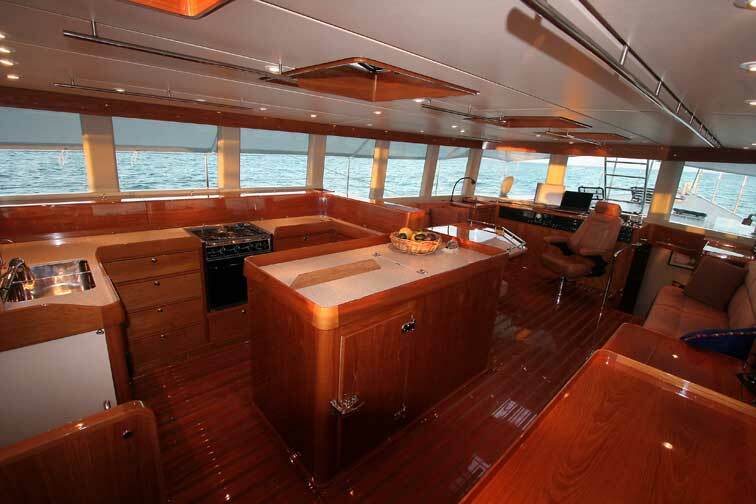 In terms of moving around the bridge, saloon, and galley area, we are optimized in the same manner as our sailing designs. Furniture is positioned so that it contains our bodies, and of course there are high fiddles, and lots of handrails onto which we can hold. In our passages so far the forward cabin has been in use about half of the time. 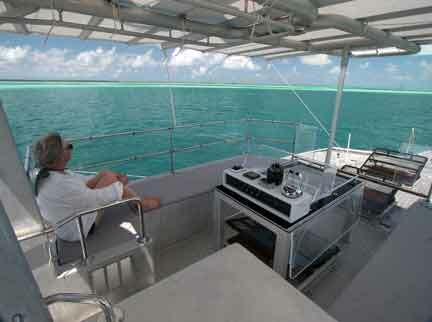 With upwind cruising we have found the aft port (double) cabin to be the most comfortable spot to retire. Our starboard sea cabin, with its upper and lower single berths has seen a single day (out of 23 at sea) where we were happier in its tight confines (with occasional 30 foot/9m waves with breaking crests on the beam). Now let’s talk about relative motion. 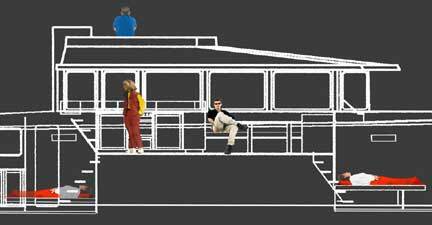 For all intents and purposes, we can assume that the roll and pitch center is roughly just aft of the middle of the boat, on top of the fuel tanks under the galley. 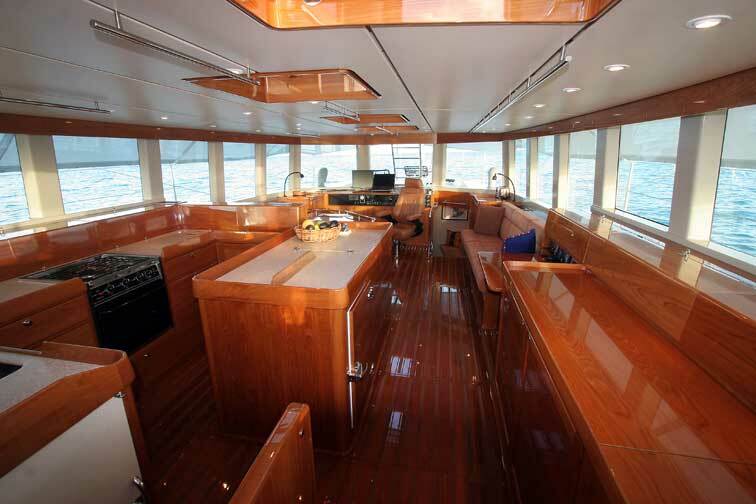 Even though the interiors are well spread out throughout these boats, the key areas of the saloon, galley and fore/aft sleeping cabins are actually very close to this motion center. The image above and those below are of the FPB 83. We have positioned some models around the interior and exterior. You can see that they are all very close to this motion center. We knew that this would work well because these relationships to the motion centers are almost identical to those we had aboard Beowulf. In addition, this hull configuration is significantly more comfortable in head seas than was the case with Beowulf or Sundeer. In the image above you can see that, when sleeping, our heads (wherein reside our motion sensors) are within 10 feet (3 meters) of the pitch center. 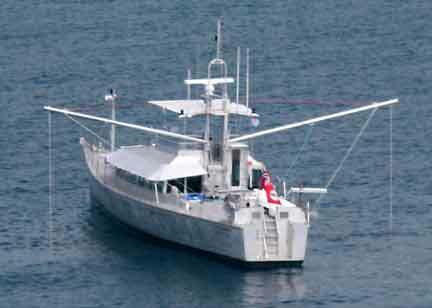 The forward bunk is on the roll center, while the aft bunk is about 5 feet (1.5 meters) off the roll center. In the saloon we are so close to the motion centers that it takes really significant sea conditions to upset our personal equilibrium. Most of the folks we know who cruise under power rarely, if ever, use their flying bridges at sea. Yet with Wind Horse we have found this is our favorite spot to stand watch, weather conditions permitting. There are two reasons for this. First, motion is minimal. Second, what boat motion there is, is not significantly exacerbated by height – this flying bridge being relatively close to the roll and pitch centers. You would expect us to be spending a lot of time up here in the tropics. 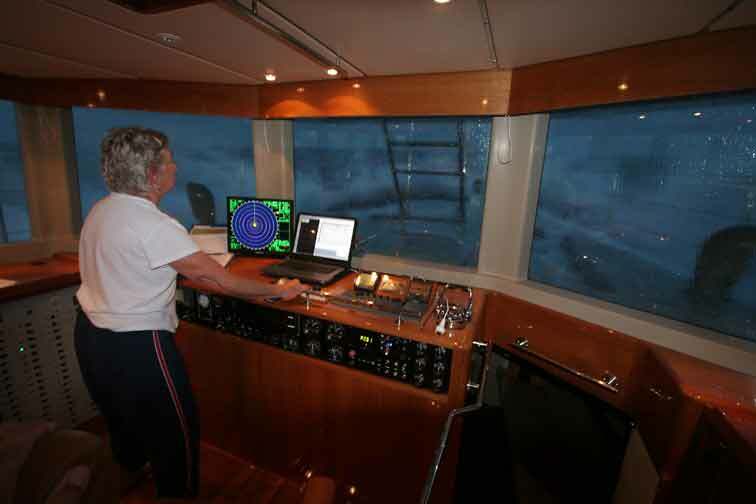 But we also find that if the weather is not excessively wet, we tend to spend part of every day on the flying bridge even in the higher latitudes. 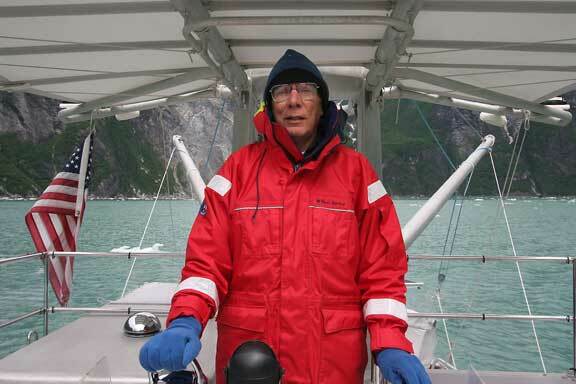 For those unprotected, rolly anchorages, we’ve got a series of advantages. First, our foils – skegs, and stabilizers – are relatively high aspect ratio and large in scale relative to the hull size and stability. They act to naturally dampen motion. Second, when required we can swing one or both of our boat booms outboard and hang flopper stoppers from them (for more information on flopper stoppers see page 420 in our book Practical Seamanship). Between natural damping and flopper stoppers, we’ve been very comfortable in the few rolly anchorages we’ve visited so far. This entry was posted on Saturday, October 15th, 2011 at 12:50 pm and is filed under Dashew Offshore, Design Objectives. Both comments and pings are currently closed. Steve, I’ve spent hours absorbing all the common sense you’ve packed into these FPBs. Your “Great Room” makes most conventional passage maker interiors look claustrophobic by comparison! Two things I must ask about, however. There doesn’t appear to be any steering wheel (I assume you use a joystick arrangement?) and there don’t appear to be any “windscreen” wipers. I’d like to see your reasons for these, assuming my observations are correct. Normal steering is with a joystick. However, there will be a manual helm pump, with a removable steering wheel on the Matrix deck for emergency steering. Re wipers, we have not found them necessary, as long as a coating of Rain X is periodically applied to the glass windows. Thanks for the very quick reply. I may not bother fitting a wiper to the half-cabin launch I’m building and see how it works out.